Home Blog Leasing Just How Flexible is Computer Leasing? Just How Flexible is Computer Leasing? 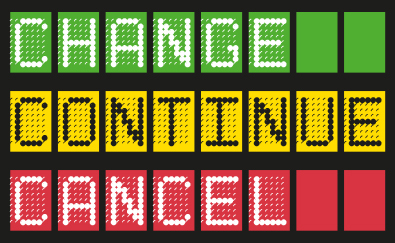 As Easy as Change, Continue, or Cancel. We’re often asked about the flexibility of leasing, and potential customers are often under the impression that leasing is inflexible and they will be tied into long contracts whilst their equipment becomes obsolete and old. We always tell them that leasing IT equipment is as simple as getting your mobile phone contract, they work in just the same way. Here at HardSoft, we are the pioneers of the ‘Flexi-Lease’, so the clue is in the name. This scheme for businesses is simple and incredibly flexible, we call it Change, Continue, Cancel. All of our customers are offered guaranteed ownership of their equipment at the end of their lease term for just £1, but they can also choose to continue with a new lease once they reach the halfway point of their lease, upgrading their equipment at the same time, allowing them to have the latest and most up to date kit. Change – technology advances at such a rapid rate that in the three short years of your lease, you can often find yourself working on an outdated device which doesn’t do everything you need it to. If this is the case, you can return the equipment and start a new lease with the latest models and be back at the cutting edge again. Taking advantage of the extras included in a HardSoft lease, such as technical support and warranty. Continue – the beauty of the Flexi-Lease means that you can always change your mind. Once you’ve reached the halfway point of your lease you can change your equipment at any time. This means that if your business is growing and expanding and you need more equipment for additional staff, you can add to your lease with the most up to date equipment available. Leasing also means that you don’t have to pay outright for the additional kit, leaving your precious cash flow intact for more pressing things. Cancel – you might find that after 3 years you’re still happy with your equipment, and regardless of there being more up to date and sleeker looking versions available, you’re happy to stick with what you have. There is some small print on this and we do charge £75 to collect and data erase your Device and we cant cancel agreements for software and those that include a Renewal and Upgrade of a previous agreement. So you can’t do a ‘Change’ option then ‘Cancel’ afterwards. If this is the case, you can purchase the device for just £1.00 and take ownership so it’s all yours to keep. The best way for us to tell you how flexible our leases are is to give you some examples of our customers taking advantage of flexible leasing in the past few weeks. Customer A had a 27″ iMac and was paying £89.70 per month. They decided to keep the iMac and also change to a new 27″ iMac with 5K Retina with a new monthly payment of £94.50. Customer B had two 13″ MacBook Pro Retina’s, paying £104.00 per month, and decided to keep them and add two new 13″ MacBook Pros with Touch Bar for a new monthly payment of £118.00. Customer C had an 11″ MacBook Air and a 21.5″ iMac, paying £68.03 per month, and then cancelled the original lease returning the existing equipment and part-exchanging it for a new iMac 21.5″ and a new 13″ MacBook Air, with a new monthly payment of £75.50. All customers were able to secure new up to date equipment and keep their payments at roughly the same amount each month.